I tend to be a contrarian value investor which means I mostly buy quality stocks that are beaten down and out of favour. These stocks are often longer-term turnaround plays with established products, sales, earnings, dividends and other boring fundamentals. This strategy offers safety with leverage if you have patience and can time an industry's macro cycle to the turn in a company's growth trend. Nine months ago I wrote about the January Effect and Shrinkflation and how they indicated a flat to down 2014nothing like the 30% and 13% gains in the S&P 500 for the previous two-years. Having experienced Fed driven liquidity market bubbles before, I appreciate the odds against 3-years in a row of double-digit market returns and that it really is never "different this time". This is why I continue switching more into cash and defensive Hard Assets that look just as timely now as in January. Going into mid September the DJIA hit as high as 17,350, and after continually making new highs the Dow was less than a thousand points from another double-digit year. I was starting to question if I would have been better off in more Momo plays this year. Luckily I resisted the urge to turn on Mad Money, reminding myself that going into October is usually not the best time to day trade. Oh how quickly markets change. All of a sudden 6-year index charts have turned from ever climbing mountains to potential October cliffs. There's another Iraq war, with Europe and Japan's economies likely headed into another recession. The market's only new sell-off catalyst this time is fear of Ebola. Ironically the Ebola play may also be the only bullish momentum trading theme out there right now. My daily Hot Sheet tracks building Momo plays with Ebola stocks consistently popping up latelyway up! A few names include companies that make medical safety equipment such as hazmat suits, to biotechnology, pharmaceutical, vaccine and related stocks. I first mentioned (AMEX: APT) Alpha Pro Tech at $2.06 last November as a growing maker of disposable protective apparel. APT traded thin with little news other than quarterly financials, which on August 5 showed Q2 sales +24.2% and expenses down, with net income +88.8%. I posted APT on September 24 at $3.11 as a volume-active percentage-gainer breaking 52-week highs, and a few times since as it ran to new all-time highs of $10.73 on daily volume of more than double its 18M shares outstanding. APT is now around half of this as investors ponder if Ebola fears will subside or worsen. Other Ebola plays include (NASDAQ: TKMR)(TSX: TKM) Tekmira Pharmaceuticals with 7 posts from $6.88 to a high of $31.48, now $18.27, to (NASDAQ: LAKE) Lakeland Industries from $7.51 on October 1 to almost $30, now $12.60. That day my filters ominously even pointed to (NASDAQ: FLWS) 1-800-FLOWERS.com at $7.59 before it made a new 52-week high of $8.61 a few days later. As Oil Breaks Down And Ebola Fears BuildAre Metals Set To Rally? Airlines? Then there's lower oil prices, diving this month to under $80 per barreldown 25% since mid July. Business TV channels must be confused over which pom-poms to shake these days as some are actually blaming lower energy prices for weak markets. Recessions and weak market expectations can drive energy prices lower, not the other way around. Unless you are directly involved in oil and gas exploration or production, lower oil prices are good for markets as energy is a major cost component in almost everything. Businesses, consumers and the economy benefit from lower energy prices and I for one cheer lower oil prices as I spend around $1,000 per month just on gasoline and furnace oil. With increasing U.S. shale oil production the only real surprise is how quickly oil prices fell and how long they managed to keep them propped up at around $100 per barrel. Like they say, "the bigger the boom the bigger the bust", and even without a recession it's hard to call a near-term bottom as the Saudi's say they will accept lower prices and not cut production to maintain market share in Asia. Contrarian investors like me often take the other side of that trade, meaning "the bigger the bust the bigger the boom". It's too early for oil, but metals must be close and are still cheap: gold and precious metals, industrial, base and even rare earth metals. Focus on the metals with the most potential and closest to coming out of their cyclical downturn. My top two metals are silver and uranium. Silver is a leveraged play on gold prices and both are established alternatives for unbacked fiat currencies. Gold is at its cost of production and I believe will go higher again, and that today's 71:1 silver price ratio will tighten closer to its historic 16:1 ratio. I also like silver because it has many industrial uses, with most consumed rather than just hoarded. I like uranium because it is an extremely low cost, efficient, reliable and environmentally safe fuel source. The number of nuclear reactors worldwide are set to double over the next 15-years and have no commercial substitute for U3O8, unlike dirty coal, oil and gas power plants that can switch back and forth if fuel costs rise too much. Many metals stocks, even some majors, are down around 90% these days. Why speculate in junior explorers with risky fundamentals and little cash when there are established producers with safe balance sheets that are just as beaten down but that you know will survive until the next upturn? For example, I'm far from an expert on aluminium but in June last year I wrote about (NYSE: AA) Alcoa at $8.12 per share when it was still a Dow 30 stock. Alcoa is the world's largest producer of aluminium and bauxite and traded around $35 for years before the 2008 market meltdown. My thesis was that Chinese production, lower prices, a Moody's credit downgrade and Alcoa's dividend cut were baked in with AA close enough to its $4.97 recession lows. This seems a good call as AA bottomed at $7.63 and is now over $16. Aluminium prices have been moving higher with auto and construction sales, and if Alcoa's financials continue improving there may yet be another double left in the stock. (NYSE: MCP) Molycorp is a leader in rare earth metals. REM demand is growing as technologies advance in alloys, fuel cells, batteries, lasers, magnets, etc. MCP controls world-class light/heavy resources and produces high-purity custom engineered REM products at its Mountain Pass mine and processing facilities in California. In May of 2011 MCP traded at $79, but by my spring 2013 article was trying to hold a $5 base level. MCP rallied to $8 last summer and its base held until May of this year, but has since broken down and drifted to as low as $1.14 last month. MCP stock charts seem to confirm fundamental concerns over more: production delays, losses, debt and share dilution. Gold and base metals should lead REMs anyway, but I'll keep MCP on my radar as a possible turnaround. I regularly mention precious and base metal companies, from junior explorers, mine developers and producers, to gold miners funds: (NYSE: GDX), (NYSE: GDXJ), to gold and silver ETFs: (NYSE: GLD), (NYSE: SLV). After a decent rally last winter many of these stocks are close to their lows again with weak metals prices. However lower oil prices mean lower mining costs, and with no fall rally in gold and Ebola fears building, could this lead to an especially strong winter for mining stocks? This may seem like a stretch but Deutsche Bank recently warned that Ebola could impact gold prices and commodity markets as it spreads to Ghana, Mali and other major producers in West Africa. Some say there is already a shortage of gold and silver with increased purchases in India and China. As stock markets test 200-day moving averages and 10% correction levels, with the U.S. dollar looking toppy, gold looks attractive even if CDC estimates of 1.4M Ebola cases by January don't happen. Then there are transportation stocks which many remained beaten down until early last year. I've written about trucking and shipping stocks that trended higher despite higher oil prices, and many airline stocks came off of financial life support and looked ready to fly. (OTCQB: AAMRQ) AMR Corp. was mentioned from $1.90 to $12 before it merged with (NYSE: LCC) US Airways to become (NYSE: AAL) American Airlines Group, now $39.82. (TSX: AC.B) Air Canada has been mentioned 14 times from $1.43 to $10.50 as they refinanced, expanded routes, started its Rouge budget airline, resolved pension deficits, and reported record: load factors, sales and earnings. The problem is that after last year's rebirth and huge stock gains, how far along are the airlines in their recovery cycle? If they are already at record capacity and charging for your first bag now, how will they increase revenue? How long before seats disappear and you just stand, or some other way to sardine even more people aboard? Lower jet fuel prices can certainly help profitability, but on top of recessions to terrorist threats, who will be flying if Ebola turns into a global pandemic? Is Spot U3O8's Bottom Now In? Are Uranium Investors Ready? For any investment you never really know a bottom was made until later, usually at much higher prices. 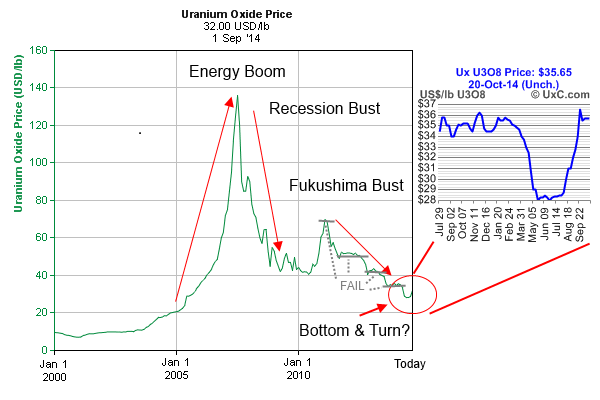 Clues may help us get closer to finding a bottom and I believe we are seeing some of them now in uranium. Last month I wrote about how spot U3O8 at $32 was up around 14% in August on supply risks, after 3-months of just sitting there quietly at 9-year lows of $28 per pound. Another clue that $28 might be the bottom is that after gaining $4 in August, spot U3O8 has jumped another $4 to today's $36. More impressive is that Spot U3O8 has held $35 for over a month. The longer this level holds, or moves above its key $40 level, the more U3O8 bottom calls we will see. Uranium is a mined metal with many uses, however most of its demand is to generate electric power. As an energy component, this is why the uranium chart below going back to the year 2000 looks very similar to an oil price chart over the same period. Both bottomed under $20 around the start of the millennium to then soar over the next 7-years to new all-time highs of around $140. By the depths of the recession both had come all the way back down to $40per barrel of oil and per pound of U3O8. Oil and uranium also moved higher as the recovery started. By early 2011 oil was around $90, with U3O8 back over $70. Then on March 11 the Fukushima nuclear accident occurred and from that point forward any correlation between oil and uranium prices seems to have ended. As oil prices moved even higher to $110, spot U3O8 kept making lower lows and failed to hold support until $28 this year. This makes no sense with more reactors in the works today than even before Fukushima, and with uranium supply constrained due to low prices, mine closures and less exploration. Growing demand, shrinking supply and low prices are a contrarian investor's dream. At some point uranium prices have to recover and again reflect strong global-energy growth trends. I may still be early but the coil just keeps tightening to when previously volatile uranium prices finally awaken from their 3+ year sleep. Analysts are forecasting serious uranium supply deficits starting in about a year. However markets tend to anticipate future prices that I don't believe will stay down much longer. Uranium's major near-term catalyst continues to be Japanese reactor restarts. Japan was the world's third largest consumer of uranium before Fukushima and still has 48 operable reactors. The debate "if" Japan will restart is now settled with the NRA's recent approval of 2 reactors in Sendai expected to restart by early next year18 other reactors have already requested permission to restart. Uranium mining stocks have had several decent trading rallies since Fukushima. They rallied last winter with the rest of the mining sector and are now back in the same chart trough. Many miners technically look cheap right now going into yearend tax-loss selling season. I see past uranium stock trading rallies as just false starts of an eventual U3O8 mega wave that could keep going. (NYSE: CCJ)(TSX: CCO) Cameco Corp. is the largest out of only six publicly traded pure-play uranium producers worldwide. Cameco is a low-cost producer with the world's largest high-grade reserves focused in Canada's rich Athabasca Basin. On October 8 CCJ started producing uranium concentrate from ore mined at its huge Cigar Lake operation in northern Saskatchewan, and the day before a workers strike ended at its McArthur River mine and Key Lake mill. CCJ is the most widely followed large-cap uranium stock, which looks tastier now near its 52-week low of $15.55 then it did in March when I wrote that I would wait as CCJ was at the top of its 3-year $16-$24 trading range. I have written about (AMEX: URZ)(TSX: URZ) Uranerz Energy Corp. since late 2010 as it transitioned from an explorer to a permitted mine developer, to an emerging uranium producer. Uranerz has explored only 6 out of 30 potential projects and controls around 73k acres in Wyoming's central Powder River Basin (PRB), surrounded by major uranium producers such as Cameco. "Uranerz Energy Corporation is pleased to announce its first sale of uranium from the Nichols Ranch ISR Uranium Project located in the Powder River Basin of Wyoming, U.S.A. The Company has sold 75,000 pounds which is a portion of the deliveries Uranerz is expecting to make this year pursuant to long-term contracts it has with its nuclear utility customers. Uranerz has three long-term uranium sales agreements with two major U.S. nuclear utilities. The Company is currently making deliveries to satisfy these contracts with shipments of uranium to the ConverDyn Metropolis Works Facility." This first sale announcement makes it official, Uranerz is now a uranium producerone of the six publicly traded pure-play uranium producers worldwide mentioned before. However lately the market has ignored uranium stocks in general, and Uranerz' news in particular with URZ still trading around $1.00. URZ' Q3 report should provide more insight into production, revenue and margin levels for investors and analysts to better get their teeth into forward ratings and targets. URZ' 52-week high last March is $1.97, pre-Fukushima high in 2011 is $5.93, and all-time high in 2007 is $7.65.